This story isn't so much about an instant, overnight success; in fact, it's more about the many different trials and tribulations that a sweeping contracting company that was started in the last quarter of 2008 could face. "Having said that, we have indeed struggled after getting started right as the recession did, too, but through an absolute commitment to doing the best possible job for our customers we've come through it all. We have every expectation that Debris Free is on an upward path." Mercer got into sweeping right out of high school, when he was looking for a job and noticed an ad in the local newspaper for a sweeping company that was looking for a nighttime sweeper driver. It seemed like the perfect job for him, he says, because he's always been kind of a night owl. When he applied Mercer says he was hired on the spot by what is now one of his competitors. His recollection is that he was earning just over four dollars per hour. After working there for about three-and-a-half years, he was offered a higher paying job with one of the largest sweeping companies in the area, which he accepted. A plus was that he had heard they had the best equipment and even offered advancement opportunities. About two-months into that job," Mercer related, "a guy that I had noticed from time-to-time in the offices, which were located across the street from where the drivers all parked, approached me one morning as I was about to leave for home. He asked me how things were going and if I liked my job and what I thought about working for their company. "When I affirmed I liked my job, he said that the supervisors had been talking a lot about my work, so he wanted to come over and talk with me personally. It turns out that he was actually one of the two owners of that company and he had come over to offer me an assistant quality control supervisor's position, which I gladly accepted!" The new position allowed Mercer to start gaining knowledge about the business aspects of the job and the industry, not just the mechanics of doing the sweeping itself. Over time, he was taught such things as how to bid jobs, how to assess the customers that would be the most valuable for the company and, most importantly, how to keep them through just basic customer service and customer relations. As he advanced through the chain-of-command, throughout the next few years of working hard, long hours and saving money, his wife and he started to consider what they wanted to do. "Neither of us were looking real forward to 'carrying a lunch bucket for the man,' so to speak, for the rest of our lives. So, we decided that it was time we let our blood, sweat and tears be used for something a little more rewarding – something for ourselves." Having some cash saved up and everything they owned nearly paid off, the Mercers founded the Debris Free company in August of 2008. However, they quickly learned that regardless of the 14 years' worth of experience Steve had previously had in the industry, it didn't mean too much to the potential customer. Those, he found out, viewed the organization as being a brand new contractor without any real work references to back their claims of producing high-quality results. "About all I had to offer at that point was my word, which is my bond," said Mercer, "and a huge desire to succeed. Sadly, that doesn't get you very far in the modern day world of business, where everything seems to be based upon what's being written in the fine print. However, we focused really hard on building a reputable reference list from what few mom-and-pop sweeps we could land. "During those first months, all of the basic but costly expenses of running a company, such as telephones, insurance, utilities, maintenance, etc., continued like clockwork. We also had to maintain our personal lives and household expenses. It was a struggle to say the least, but also manageable." In retrospect, Mercer said an almost insurmountable mistake was to pay cash for his first sweeper, which cost right at $52,000 dollars. Since they had the money in the bank they decided that paying cash would alleviate the monthly sweeper payment during the times they were building the company. However, it didn't help them build a worthy credit history to suffice the needs of their business, which they soon realized they would need. "Looking back," said Mercer, "although buying our MASCO sweeper with cash was both a good and bad decision since we didn't have payments to worry about, not gaining credit was an unfortunate downside. We also ran into several unforeseen and very costly misfortunes right from the start that we didn't plan for in the beginning. "Through my own beginner's neglect to check the oil, we had to replace the auxiliary engine on our sweeper to the tune of $2,300 dollars. Out of the blue we also had unforseen expenses from two deaths in our family. My wife's brother was killed and then my mother passed away. "These issues certainly took their toll on both my wife and me, not only financially, but mentally as well. We quickly learned that being a business owner was not an easy task and that it was very demanding of our time, health, and resources." Looking back on his own experience, Mercer suggests that someone getting into business as a startup with limited funding may want to consider buying a good, used sweeper, and doing it on credit even if you can afford to pay cash. Just know that either way, cash or finance, there's going to be some risk involved, so think things through wisely. From August 2008 to mid-2009 the couple had worked enough small sweeping jobs to finally build work references sufficient enough to land the company's very first monthly service contract. When, in July of 2009, Debris Free was awarded agreements for sweeping four small properties for the same property management firm, it appeared to be the breakthrough they had worked for. "Not only was this our very first real annual contract," said Mercer, "but we had our foot in the door with a company that was large enough we could build on. I was completely confident that our high-quality work would sell itself for more of their properties." He was right: From 2010 to 2011, Debris Free gained agreements for sweeping an additional six more of the firm's higher-end shopping centers. By the start of 2011, they were servicing nearly every shopping center in the management firm's entire portfolio at an annual sales just under a quarter-million dollars. Then, the economic climate took its toll. "About the time I was considering purchasing another new sweeper and expanding away from this one customer," said Mercer, "in February of this year – just two months into our new 2012 agreements – the bottom fell out and we received 30-day notices on over 75% of our accounts. Practically overnight, the management of Debris Free's primary and most loyal customer was forced to contract with what Mercer termed "...a cheaper broom-and-scoop outfit that I just can't compete with. You cannot do a quality job of cleaning at the same prices of an outfit that does not use power sweepers. All the company that replaced us have are hand brooms and dust pans. They just do not have the overhead that we have and can easily undercut my prices to a level that I can't and won't even try to compete with them." Until the economy stabilizes and tenants start leasing the vacant spaces again, Mercer's goal is maintaining the company's current operations by doing what they can, where they can, with their current accounts to make ends meet. They began offering additional services, such as pressure washing and graffiti removal on a small scale basis, along with continuing to sweep. Our prices are already at a rock bottom low," said Mercer. 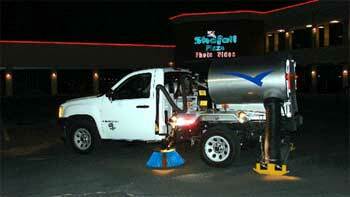 "We simply can't drop much more without having to pay the customers to sweep their properties. Although we get a few nibbles when a new shopping centers opens, in those situations we are typically bidding against over a dozen other contractors that are trying to land the same account, too. This often leads to a lot of undercutting and other petty tactics which are not something I want to become involved with. "What it has boiled down to in recent times is which contractor will offer the most services for free; unfortunately, that's the one who will likely win the agreement. We know what it costs to do a good job, and it makes me wonder just how much lower can some of these guys today will go before they realize that tomorrow they will be out of business. "You know a number of those firms won't make it in the long run; my hope is that they don't take us all down with them along the way!" Note: The audio podcast with Steve Mercer, which is approximately 22 minutes in length, will play without downloading any files onto your computer. If you hear the interview at 'chipmunk speed,' you will need to download the latest version of Adobe's free Flash player. 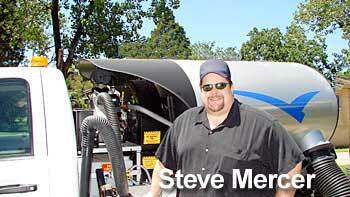 Steve Mercer may be reached via email sent to steve@debris-free.com. 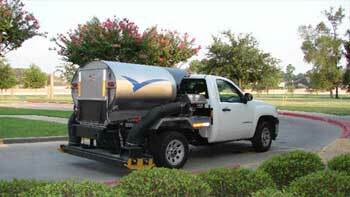 You may also reach the company by calling 713.670.7434. The company's website is located at www.Debris-Free.com.